Whether your wood floors are newly installed or are over a hundred years old, they are a striking feature in your home. Wood is naturally resilient, and when sealed with a urethane finish, it can withstand heavy use for many years before it needs to be refinished. However, they do require more meticulous care and maintenance than vinyl, laminate, and tile. While there are many commercial hardwood floor cleaners that you can use, there are several reasons why you should use a homemade wood floor cleaner instead. Many of the commercial products on the market contain harsh chemicals that can irritate the skin, eyes, and respiratory system and can be extremely toxic if ingested. If you have pets and children in your home, you should steer clear of the cleaning products at the store and opt for a natural wood floor cleaner that is safer and better for the environment. There are several different ways that you can mix up your own hardwood floor cleaner. DIY cleaners all use simple ingredients that you probably already have in your home, and that cost a fraction of what you’d spend on a commercial cleaner. The best hardwood floor cleaner will effectively remove the dirt and grime without harming the finish of your hardwood flooring. Combine the castile soap, water, and essential oil and pour into the spray bottle. Replace the lid and shake vigorously. Test the homemade cleaner on an inconspicuous area of your hardwood floors, like under a piece of furniture, to ensure it won’t cause damage. Working in small areas, spray the solution onto the floors. Be careful not to overspray too much of the homemade wood floor cleaner to avoid damaging the floorboards. Using a back and forth motion, work the floor cleaning solution along the grain of the wood, with the microfiber mop. Continue to work in small areas being sure to rinse and squeeze any excess water off the mop. Remove excess dust and dirt by vacuuming or sweeping the floors. Pay particular attention to the entryways and other areas that see heavy traffic. Combine the oil and vinegar and pour into a spray bottle. Mix a fresh batch every time you clean to avoid the oil becoming rancid. Spray the cleaner onto the floor and mop with a microfiber cloth. The vinegar will remove the dirt, while the oil will help to condition the wood, so it doesn’t dry out. With a clean mop head or soft cloth, wipe the residue off the floor. To bring out the shine, dry the floor with a gentle circular motion. Vinegar has become an extremely popular “green cleaning” product in homes that are looking to reduce chemical buildup in their homes and protect the environment. Rich in acetic acid, vinegar is a powerful antioxidant and antimicrobial agent. It is one of the best natural cleaning products you can use to clean your hardwood floors. Mix one-gallon warm water with ¼ cup vinegar and one tablespoon castile soap. Add to a spray bottle. Sweep or vacuum your floors to remove as much dust and dirt as possible. Spray the floors, working a small section at a time, with the cleaning solution. Scrub in the direction of the wood’s grain to remove as much dirt and grime as you can. Wipe the floor dry with a soft cloth when the floor is clean. Start by vacuuming or sweeping your floors to remove as much as the dirt as possible. In a spray bottle, mix the dish soap and vinegar. Spray the cleaning solution on a microfiber mop head. Working in small sections, begin mopping the floor in the direction of the grain, continually spraying the mop head as you go. Like vinegar, black tea, combined with water, is an effective homemade floor cleaner that shines your floors. The acidic levels in the black tea effectively lift dirt from the floor without the harsh effects that some floor cleaners have. The tannic acid in tea will provide a high shine to your floors. Black tea will remove more dirt without harming the finish on your floors. In a large pot, bring the four cups of water to a boil, then remove from the heat. Add the black tea bags and allow to steep for ten minutes. Remove the tea bags and soak a soft cotton cloth or mop cleaning pad in the solution. Reattach the cloth or mop pad to the mop and wipe down the floor. Hardwood floors are a wonderful addition to any house that can significantly improve the interior aesthetics. Wood floors can also make your home greener. The best way to clean your hardwood floors will depend on the finish. Most of the modern sealants are water resistant, making care and maintenance a little easier. It is essential when cleaning your wood floors to use any water or cleaning solutions sparingly. On a regular basis, you should be sweeping the floor to remove dirt and dust that can scratch the floors. You can quickly dust your floors with a mop that has been treated with a dusting agent to pick up dust, dirt, and pet hair. You can also use a vacuum the floor with a floor-brush attachment to quickly pick up dirt and grime. When a deeper clean is needed, you can use a wood floor mop and one of the natural cleaning solutions previously discussed to clean your floors. Just saturate a rag mop or sponge in the cleaning solution, then wring out most of the water. The mop should feel slightly damp to the touch. Damp-mop the floor, being careful to avoid standing water on the floor. With a clean mop, dampened in clean water rinse the floor. Be sure to wipe up any excess liquid to prevent your floor from becoming damaged. Along with being durable, hardwood floors bring warmth into a home, and with the proper care and maintenance, they can last for decades. You can quickly remove the dirt and grime from your hardwood floors without risking your family’s health. 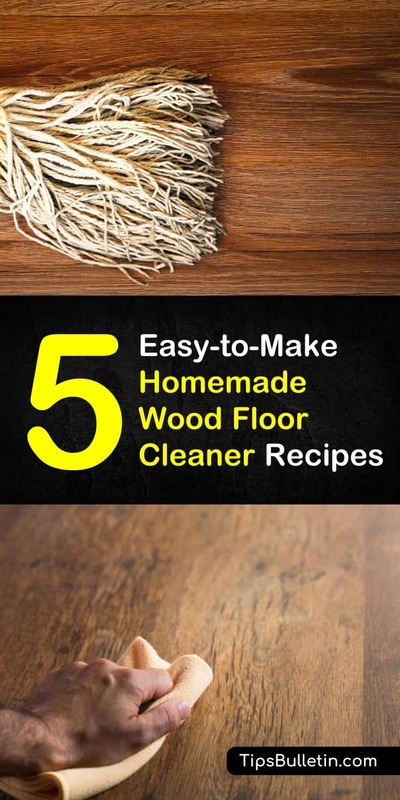 These five simple all-natural hardwood floor cleaners work just as well as the commercial chemical cleaners without leaving behind a toxic residue. We hope you enjoyed learning how to make your own homemade wood floor cleaner to keep your hardwood floors clean and looking beautiful. 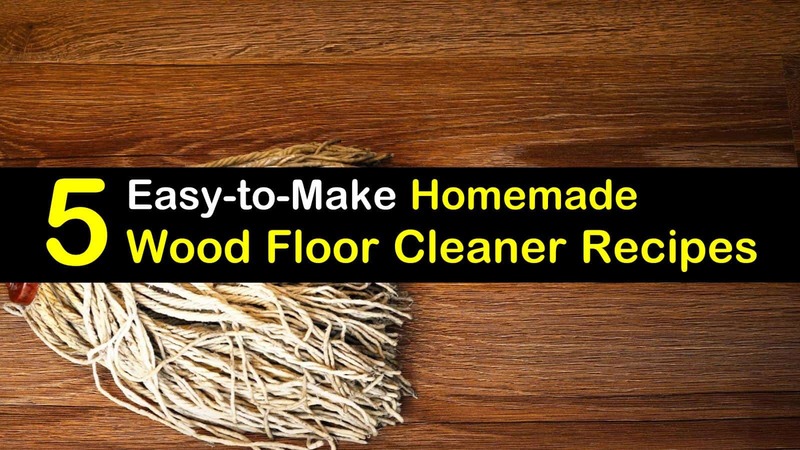 If you found these DIY wood floor cleaner recipes useful, please share it with your family and friends.